EMPORIA, Kan. — After one possession in Saturday’s Kansas Class 6A state championship game, the sun was shining on the Blue Valley Tigers. Figuratively, of course, because the Welch Stadium field was a sheet of ice. An early lead lasted all of about two minutes — and the Tigers’ chance at their first Class 6A title slipped away. 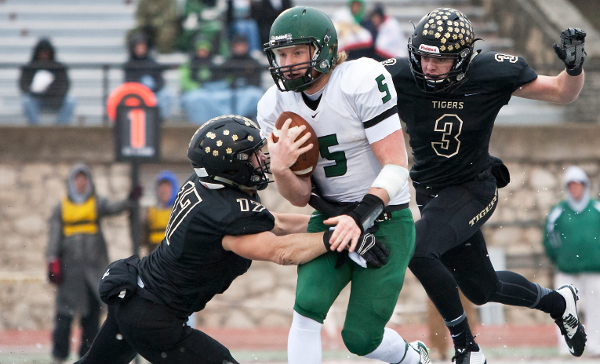 Derby scored 20 unanswered points on their way to a 27-14 win over Blue Valley to claim their second state title in three years. While the Tigers were held to 149 yards of offense, The Panthers’ Brady Rust was responsible for more than 400 by himself, rushing for an eye-popping 309 yards on the ice-covered football field in Emporia and passing for another 97. “It wasn’t easy out there,” Rust said. “Once you were able to get around the corner, you could find some footing. The Panthers become just the fourth team in 32 years to win multiple state titles in Kansas’ largest class. Since 1983, only Lawrence, Olathe North and Hutchinson have won multiple titles. Indeed, the Tigers had just 98 yards of offense after the opening drive that saw them score on an 11-play, 61-yard drive. Despite being outplayed much of the day and trying to hold Rust at bay as much as they could, the Tigers were still within a couple of scores early in the fourth quarter. They turned a fumbled snap on a Panther punt into a 21-yard touchdown pass from Colton McCumber to Taylor DeBey with 9:11 to play. They were even within a whisper of getting right back to even with about three minutes to play. Blue Valley’s Richard Daily snuck through to block a Derby 19-yard field goal attempt with 4:15 to play. The Tigers took over at their own 9. A pass interference gave them a first down at the 21, but a 11-yard sack on third down put them in a deep fourth-and-15 hole with 3:07 to play. McCumber rolled to the right and then cut back to his left and were it not for a shoestring tackle by Tommy Carter at the 24, McCumber might have eaten up another 20 or 30 yards and put the Tigers in real position to challenge for a game-tying touchdown and potential go-ahead extra point. Instead, the Panthers took over and scored a couple of minutes later to put the game out of reach. “I’m so excited because the kids are excited,” Derby head coach Brandon Clark said. The Panthers had built their 20-7 lead after Rust hooked up with Kaleb Kelley on a seven-yard touchdown pass with 2:32 left in the third quarter. Rust capped his senior season with the 309 yards rushing, 97 yards passing, two rushing touchdowns and two passing touchdowns. “He’s a great playmaker, just a great football player,” Clark said. “He had a great game and he deserves every bit of it. The Tigers got on the board first marching 61 yards on 11 plays on their first possession of the game. McCumber went in from five yards out to put Blue Valley up 7-0 after the extra point. But that would be it for the Tigers in the first half. They would manage only 21 more yards of offense, punting away the ball on their final five possessions of the first half. Derby, meanwhile, bounced back from the early deficit to take a 13-7 lead at the half. Their first score came just three plays after the Tigers took the lead. Brady Rust called his own number — as he did most of the day — on a third-and-1 call at his own 21 and went untouched around the left side for a 79-yard touchdown run. The Panthers then used another big play to take the lead early in the second quarter when Rust found Kenyon Tabor across the middle on fourth-and-5 play form the 20 to put Derby up 13-7 after the extra point. Rust would go into the locker room with 139 yards on 17 carries.